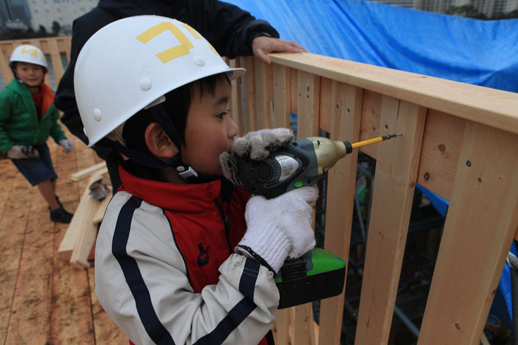 In a hardhat and windbreaker, artist Tadashi Kawamata could almost pass for a construction worker, lining up wooden planks and nailing them down. What gives him and his team away are two things: their slightly too neat appearance (in matching jackets and hats) and the lack of a tent and metal screens. Most construction in Tokyo takes place under a cloak of aluminum and plastic; this one takes place out in the open, and this transparency is a cornerstone of Kawamata’s work. The artist, based in Paris, is known for creating wooden structures that, when in proximity to modern ones of concrete, steal and glass, appear shack-like, temporary and fragile. 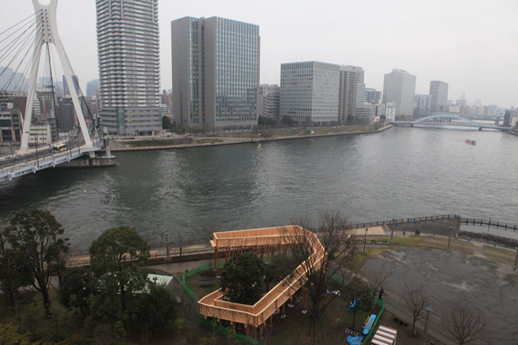 In 2010 he began work on Tokyo in Progress, a series of constructions at three different points along the Sumida River and his first project in Japan in nearly a decade. The first work, Shioiri Tower in the city’s northern Arakawa-ku, was still under construction when the March 11th earthquake struck. (Despite having the rough appearance of a child’s work made out of Popsicle sticks, the structure was not damaged in the quake). 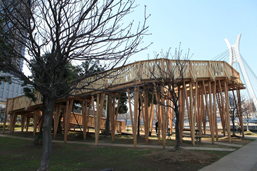 A year later, the artist’s team is nearly finished with the second structure in the series, Tsukuda Terrace, a sloping wooden terrace in Place de Paris, Ishikawajima Park, located in a waterfront area in Tsukuda, Chuo-ku. This one, as far as the plans look, seems to be neater and less conspicuous – more like something city planners might put up than the fantastical, slapdash appearance of the first construction. Both, however, bring out a child-like reaction: wherever there is an accessible climbable structure, one is tempted to climb it. In this case, the view would hardly be different from the ground, but the act of climbing puts one off one’s normal path and – ideally – in a different mindset. Like the Shioiri Tower, the Tsukuda structure looks over the river towards the Sky Tree, the 634m broadcasting tower that will be completed this spring. With its spire already in place, the Sky Tree is the tallest landmark on the Tokyo skyline, and a symbol for the city’s unbounded upward trajectory. Kawamata has positioned his works as vantage points from where Tokyoites can pause and give a moment’s thought to this so-called progress. “Various walkways, a sense of ease and nearness to the water – you just don’t get that. Instead, there’s breakwater, concrete. All this disaster prevention material is the main thing. 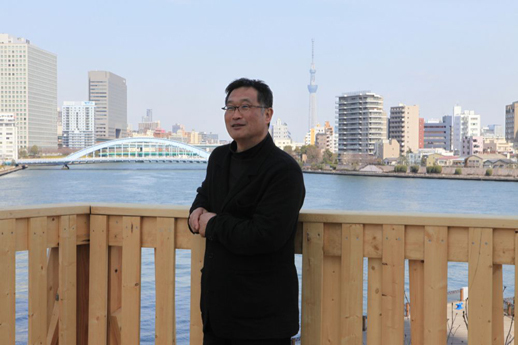 It’s not a very inviting place, which is a real shame, I think,” says Kawamata, taking a break from construction and looking out over the water. The Sumida River is Tokyo’s main waterway, running north to south and emptying into nearby Tokyo Bay. It once bisected the city, though westward expansion has now placed it firmly in the eastern part of the city. It is a symbol of an older Tokyo, a time when goods and people were transported up and down the river, when geisha entertained patrons on pleasure cruises – at least that’s what the images in ukiyo-e would lead one to believe. 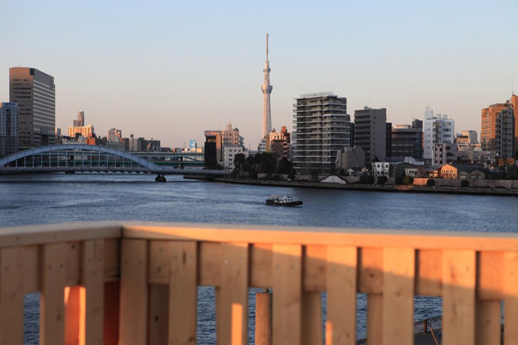 But it is not a symbol that has survived modernization, having been replaced by man-made monuments like Tokyo Tower and now, supposedly, by the Sky Tree (only time will tell if this one will truly win Tokyoites’ affection). What makes Tokyo in Progress interesting, however, is less what it has to say about the city, and more what it has to say about these people who live in it, and where their affections lie. For that, it’s necessary to look at the process of creating from the beginning. The end result is a spiraling platform, shaped like a slightly angular lower-case ‘d’ and fashioned out of fresh two-by-fours. At its highest point, about five meters, it is still no higher than the few trees in the park. 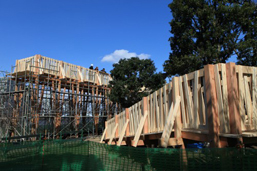 For Kawamata the experience of working on the first and second structures was markedly different. “There’s the part of town with the old wooden buildings and the part of town with these new skyscrapers, and the communities are separated this way — I could really see that,” he explained. In fact it too is not devoid of tall and modern buildings, and yet Arakawa-ku, site of the Shiori Tower, still conjures up alluring images of classic shitamachi — the historic, working class “low city” with two-storey wood-frame buildings. Chuo-ku is representative of the new, though it too was once shitamachi. Now, it is home to some of Tokyo’s most expensive real estate, department stores and the headquarters of major corporations. Those who have bought into the neighborhood’s new skyscrapers already have sweeping city views, and their own private ones at that. Between the lines of Kawamata’s neat, angular terrace it is possible to extract a narrative about the rise of an urban elite who favor insularity and uniformity. Though it isn’t necessary to see the work as something so chilling; in reality, it will probably become a play piece for neighborhood children and a small detour for local dog-walkers. It may even become a place that fosters community. 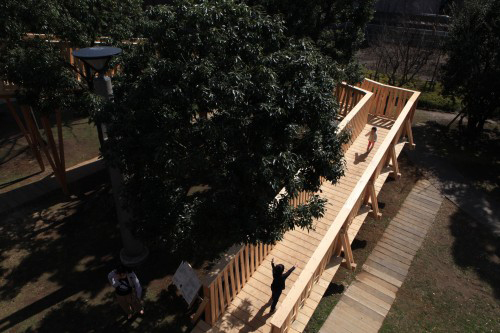 Kawamata’s bottom-up approach to design – working with the local community to create something that fits in with its surroundings — puts him at odds with the Sky Tree, the focal point of his look-out posts. Though as the artist notes, with a laugh, it is hard to imagine anywhere where the Sky Tree would fit in; it’s just too tall. His preferred medium, wood, is another strike in the opposite direction. It is Kawamata’s attachment to community that dictates his choice of material. Wood, he points out, can be assembled on site and requires little specialist skills, making it easy for volunteers to get involved. Even a few local residents have been swayed into picking up a hammer and pitching in. “Often works are assembled in a workshop and then brought to the site. In my case, everyday I’m out here working, I’m able to show that process,” says the artist. Tokyo in Progress is not unique among Kawamata’s works for being in public space (though it is unique in its Tokyo location): his creations have appeared on treetops in Berlin and perhaps most famously clinging like wasps’ nests to the side of the Centre Pompidou in Paris. Kawamata likes working in public spaces, he explains, because they exist outside the insular, often exclusive, art world. Tokyo in Progress, indeed. It is the very threat of earthquakes, and subsequent fires, that led the city to abandon wood as its own material of choice. What then to make of this fixation on building upwards, and the view to top all views? Kawamata is certainly right in this regard: it is something to stop and think about. Both sites are free to visit and are planned to remain installed until 2013. TABlog also published an article last year on the Shiori Tower project.